Discipleship is all about time and energy. Time with our Rabbi, Jesus. Energy expended in the daily journey of following in His foot steps. Radical obedience to His teaching. There is no short cut. There is no quick fix. There is no fast tracking a relationship with Jesus. Discipleship has always been about time and energy. Today’s world is set up against discipleship. Yet, discipleship is what our world needs above all else. Dallas Willard; once said, “There is nothing wrong with the church, that discipleship won’t fix.” Take out the word “church” and substitute any noun or pronoun and the truth still remains. There is nothing wrong with the world, with me, with you, with our small group, with this job, with our politics, with our families, that discipleship won’t fix. In the same life pumping artery, there is nothing wrong with our personal lives that discipleship won’t fix. The only caveat is that it takes time and energy. A “fix” may be what we desire, it may be what we have been shaped by our world to expect, but discipleship does not work that way. From the very beginning, we humans, were designed for relationships. God told Adam, it was not good for him to be alone. God was in fellowship with Adam and Eve. A relationship can not be fast tracked. In one of my other posts, KISS Principle For Discipleship or It’s All About Relationships I outlined the process necessary for building any relationship. 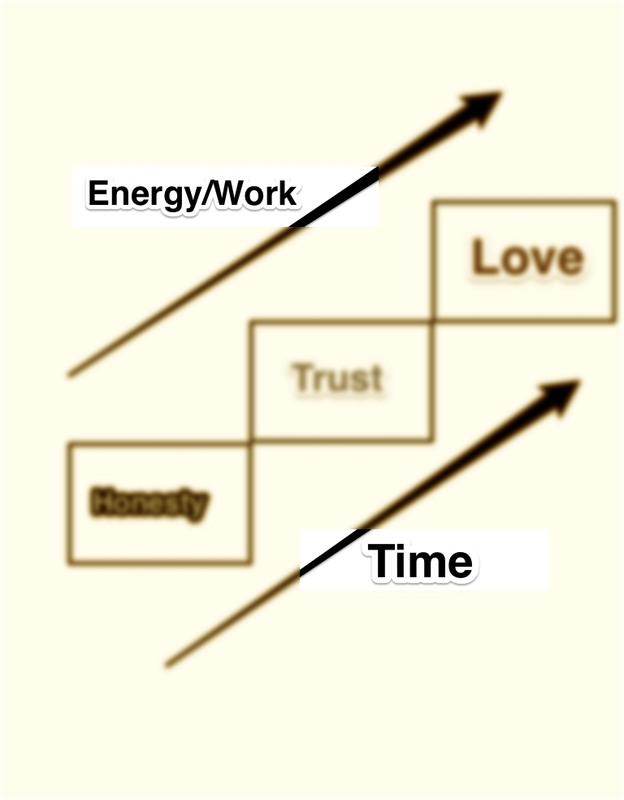 Honesty builds trust and trust builds love. 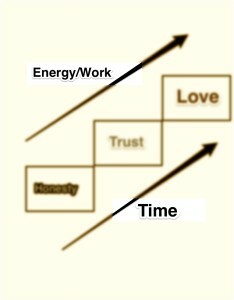 While one can look at this and see the truth of the journey, most tend to ignore the Time & Energy factors. Think about how a relationship is built with a spouse. A person spends time and pours energy into getting to know someone. They open up and risk a small amount of honesty with that person. Then they sit back and observe, what does that person do with my honesty? Do they honor it, protect it, or do they make fun of or criticize me? If the honesty is received, they begin to build trust. With trust comes more honesty. With more honesty comes more trust. This pattern is repeated over time, with above average energy. Questions come to the surface, “Is this the one? Do I love them? Could I love them? Do they love me? Eventually, a love relationship grows. This relationship journey happens the same way with our Jesus. The infatuation stage in a human relationship tends to mute our awareness to the amount of time and energy that it takes to build the relationship. Conversely, in discipleship, we become painfully aware of the amount of time and energy required to be in a relationship with Jesus. We want to be fully developed spiritually, rock solid in our faith. We detest being prone to painful sin patterns that we have practiced over many years. As you journey in discipleship, reminders are needed along the narrow road, of the time and energy that is a prerequisite of every relationship. Nothing can be substituted for time with Jesus. Nothing is more deserving of our energy, than Jesus. In Jesus’ day, discipleship was a full time occupation. Today, we are called to nothing less.